Why Is Donald Trump Suddenly Interested in the F-35? President-elect Donald Trump sent Lockheed Martin stocks plummeting on Monday morning after he published a hostile tweet about the huge cost of the F-35 Lightning II program. By now, it’s well known that Trump’s tweets have a tendency to set the daily news agenda on his own terms. For example, last week Trump tweeted about cancelling an upcoming order for a new Air Force One. It was later revealed that his explosive remarks were an apparent reaction to the Boeing CEO Dennis Muilenburg’s critical remarks about Trump administration trade policies published in the Chicago Tribune just minutes before the tweet was sent. So why, now, is Trump interested in the F-35 program? Here’s a hint: The easiest way to figure out why Donald Trump sends a tweet is to follow the news stories about him leading up to the particular message. 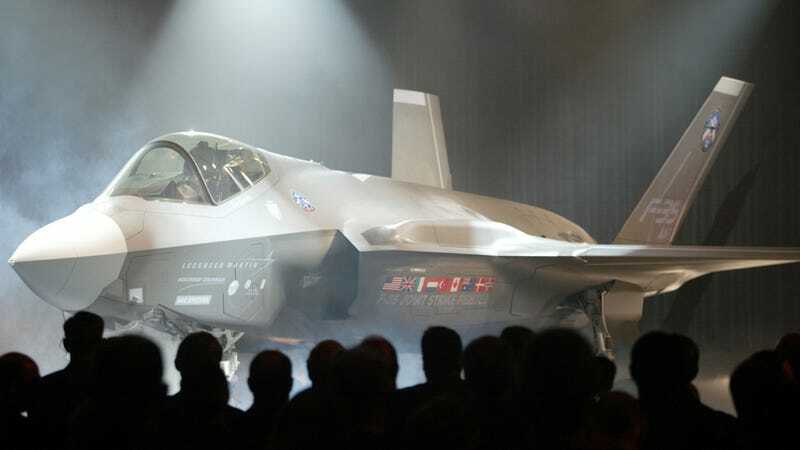 Trump fired off his new F-35 tweet just hours after US Defense Secretary Ash Carter visited Israel to help the country welcome the arrival of the first two F-35 jets it purchased from the US government. Israel has ordered 50 of the planes from the US at more than $100 million each. The aircraft are supposed to help Israel maintain a competitive edge over other countries in Middle East, and Israel is the first US ally to receive the plane. It’s unclear if Trump intended to undermine efforts under Obama to build a next generation fighter jet, or simply to draw attention to an already controversial situation. Indeed, the tweet also came just two days after Trump called attention to a Washington Post article about the Pentagon wasting money. The story claims that the Pentagon buried an internal study that exposed $125 billion in administrative waste. The report was hidden out of fears that Congress would use its findings to reduce country’s the defense budget. But what seems even more noteworthy is that Trump’s latest tweet arrives just a few days after an international hacking scandal that questions the legitimacy of his presidential victory. This weekend, following President Obama’s order for a full report on “cyber attacks and foreign intervention into the 2016 election,” US intelligence officials told multiple news outlets that Russia used hacking as a tool to benefit Donald Trump. Trump responded to the reports by defiantly criticizing the CIA and US intelligence officials. “I don’t believe [the CIA report] at all,” Trump said in a Fox News report this weekend. The president-elect’s criticisms of the F-35 program also appear to discredit US military following the CIA’s report. While other Republicans including Senate Majority Leader Mitch McConnell and Sen. John McCain have owned up to the importance of the report, Trump has remained defiant as ever. As it were, Trump isn’t exactly the only one criticizing the F-35 program and the Pentagon’s oversized budget. The F-35 Joint Strike Fighter program is viewed as one of the most expensive military blunders of all time, and flight performance of the F-35 was still a major concern until earlier this year. According to a damning Pentagon report published in March, F-35 software bugs have plagued the aircraft for months. So Trump’s line of thought is not new. We’ve heard before that the futuristic aircraft has actually become a gigantic waste of money. But why is Trump suddenly interested in a longstanding debate over defense spending? Maybe he’s getting ready to do his job as commander-in-chief. Maybe he’s just hungry for attention.